I built this as part of a GB, but I thought you might want to see it in the ships subject line. This is my first ship / boat in 20 years and my first experience with small P.E..
Manufacturered by Trumpter and I also added P.E. 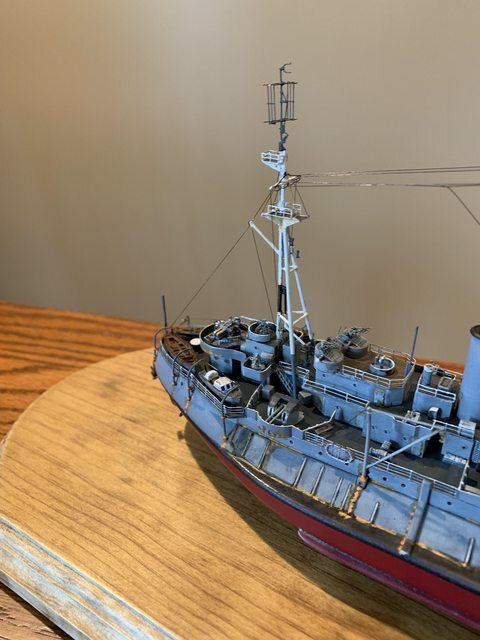 by White Ensign; brass turned barrels by Master Models; and a wood deck kit from Hunter. I used Model Masters and Valejo paints. Enamel washes and pastels were used for weathering and numerous parts were dry brushed with lighter shades of the base colors. The rigging was nylon clear sewing thread .1001 thick (human hair) which I darkened with a sharpie black marker. The wood base was sourced from Hobby Lobby. My MH son helped me sand, tack-cloth, and stain it. He also helped antique the name plate and really enjoyed the process. Lots of intricate work on display - that's a fine looking model! Ben, that is really a beautiful ship build. Please do some more. What is the history behind that ship? At least when di it sail? that is one weird looking ship ben, but beautifully done . The Roberts was the last monitor. Britain was enamoured with them, and built quite a few in WW1. The Roberts was built tween the wars, and used in WW2, along with a sister ship. It was used for artillery support for invasions. It had guns but shallow draft so it could get close in to the beaches. 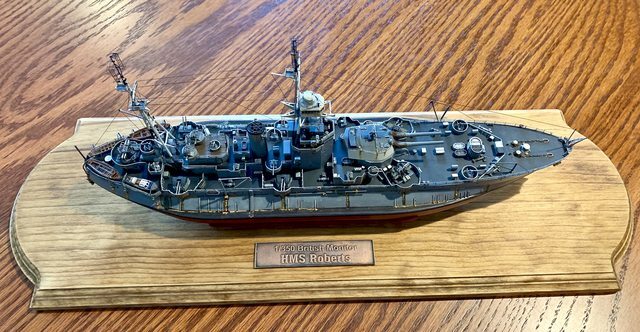 HMS Roberts was a Royal Navy Roberts class monitor of WW2. Built in April 1940, launched April 1941, and completed on 27 October 1941. 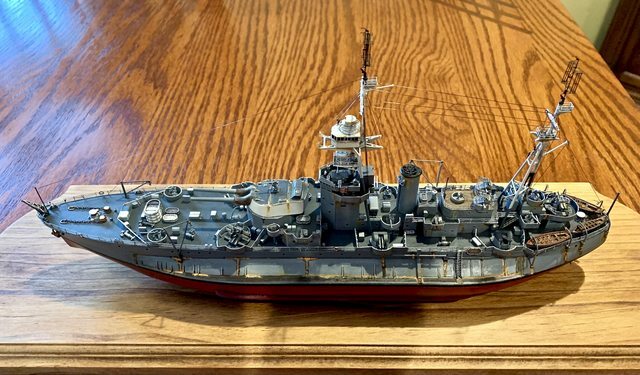 She reused the twin 15-inch gun turret of the First World War monitor Marshal Soult. The HMS Roberts provided bombardment support during Operation Torch in North Africa, where she was damaged by two 500 kg (1,100 lb) bombs. She was repaired in time to support Operation Husky (the invasion of Sicily) and the Allied landings near Salerno during Operation Avalanche. During the D-Day Landings, she was positioned off Sword Beach. She also took part in the Walcheren (Island) Operations. In July 1945 HMS Roberts departed the United Kingdom for the Indian Ocean to support Operation Mailfist, the planned liberation of Singapore. She was near Port Said at the time the Japanese surrendered, but was not recalled until 11 September by which time she had reached Kenya. After the war she was retired, sold for scrap, but later re-used. She was broken up in July 1965. One of Roberts' main guns is mounted outside the Imperial War Museum in Lambeth, south London. I remember, at an early age, wondering why the turret was raised up so high. Later, I learned it wa a necessity. Naval rifles of a certain size need a lot of room to contain the elevation gear, and also the loading hoists, so the gun house winds up being about a "deck" deeper than the turret proppper. Then, you also need two decks for the powder flat and the shell flat to serve the loading hoists. The Roberts, and her ilk were shallower than other capital ships. So, the height of the turret was somewhat fixed. Which moves the turret further up out of the hull girder. 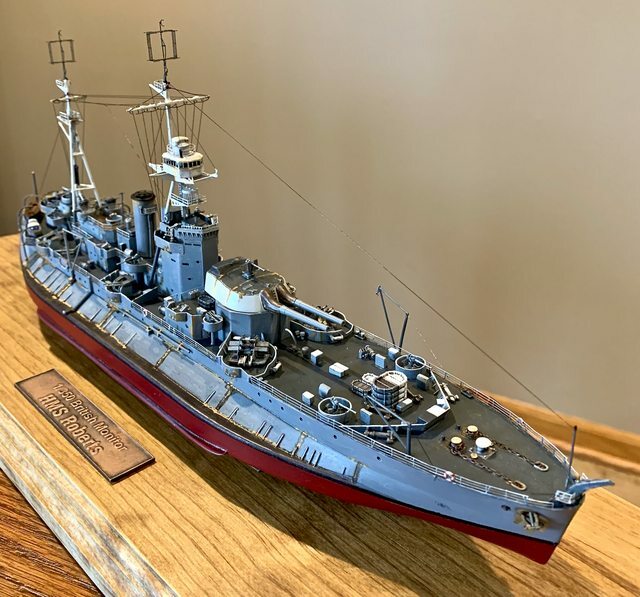 Now, in another ship, one less meant as a war-time expediant, no doubt a forecastle deck would have been installed which would have made the ship a little less ungainly looking (and might have offered a drier bow in full seas). 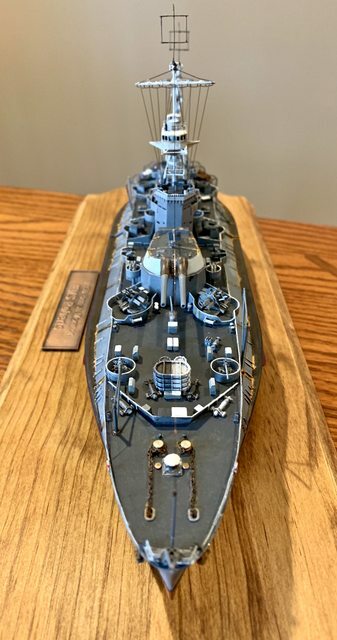 You (and your son) did a fine job on this model! Really like the paint work you did and the PE looks spot on. "Le temps est un grand maître, mais malheureusement, il tue tous ses élèves." Gene1, Thanks! 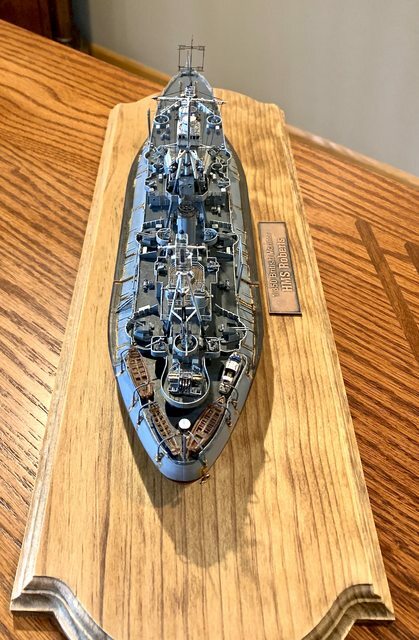 our next ship is most likely either the 1/350 Yamato by Tamiya or the 1/350 Arizona from Hobbyboss. Mike, Thankyou for the kind words. I'll tell him as he is really proud in helping.